Is your kid a fan of the 8 5 Man? Last season, P got to go to a couple of the Bengals pre-season games and during “downtime” (which for a three year old starts about four minutes into the first quarter), I challenged her to find number combinations. Can you find a 3 and a 2 together? That’s Cedric Benson! He’s really good P.
What about a 1 and a 0 together? That kid’s name is Kevin Huber and he grew up right here in Cincinnati (near) can you believe it? This one is tough, what about an 8 and a 5? 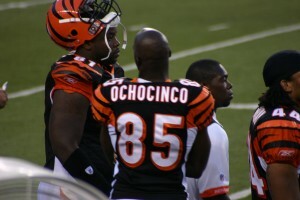 That is Chad Johnson and he is one of the best players ever! 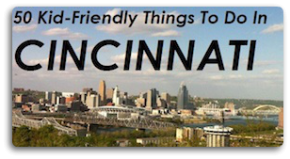 Yep, Chad is the “8 5 man” and da man in Cincinnati. 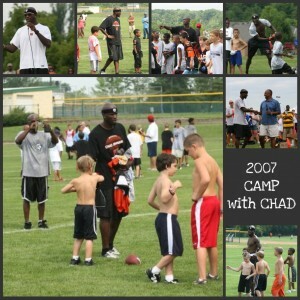 So how exciting is it that he is hosting a football camp this Summer for all his pint size fans? The two-day camp is open to boys and girls ages 7 to 14 and runs in the morning on July 22nd and 23rd at Sycamore High School. Can you imagine the hero you’d be to your kid? Learning how to run a route or catch a high one from the master? OMG! Think there is anyway I could pull off 14? You can get all the information here if you are interested and we wanted to let you guys know that Pro Camps and Skin It (the host and promoter for this camp and many others around the country) are giving away a CAMPERSHIP to this awesome opportunity. The winner of the Chad campership will be announced on July 12th. It would absolutely make our day here at FFC if one of our readers was that lucky winner! So make it happen, k? If you have any questions, leave them here and I will forward them on to the organizer and get you an answer. Good luck – to you and the 8 5 man and the Bengals!! Could 2010 be our year? PS: Skin It is also giving away a campership to three other ProCamp’s instructional camps this summer: Chris Paul Basketball Camp; Dwight Howard Basketball Camp; and Kevin Durant Basketball Camp. Of course knowing nothing about basketball, I can only assume these guys are pretty hot stuff? If you want to enter for these camperships, just substitute their name and basketball in the twitter and facebook posting.